eBay CEO John Donahoe said Wednesday that brick-and-mortar retailers are leveraging their stores as fulfillment centers. He was responding to a question from a Wall Street analyst who asked about its eBay Now same-day delivery mobile app, and he revealed some interesting plans for the service. 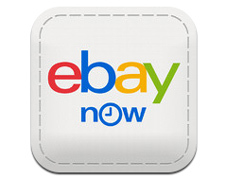 eBay Now charges consumers $5 to deliver an item to them within an hour of ordering - however, the items are purchased from retail chain partners, not from eBay Marketplace sellers - at least for now. The service launched in test mode in San Francisco. The analyst, Youssef Squali of Cantor Fitzgerald, asked if eBay could break even on the $5 it charged shoppers for using the service, or if it was a "transaction accelerant" over time. Donahoe revealed that while most orders were delivered within an hour timeframe, "consumers like choice" - they want the ability to schedule their deliveries outside the 1-hour window. Retailers like the service because it leverages their stores as fulfillment centers, he said, and eBay has been focused on providing a great customer experience. As it rolls out eBay Now to Chicago and Dallas, eBay will be focused on two things. One is driving more scale - eBay Marketplaces has a fair amount of local transactions, where buyers and sellers live in the same area, so "we can begin to build more density within those cities." The eBay Marketplace volume and the retailer volume provides eBay with "the most compelling economics." Two, eBay will experiment with other delivery approaches, including taking more of a marketplace approach to delivery, "where we have vetted delivery drivers and use what I might call a more Uber like approach to the delivery side." Unlike Amazon.com, eBay has no fulfillment centers of its own, and Donahoe referenced several times the fact that "retailers are leveraging their stores as fulfillment centers." And it's not just through eBay's Now service. eBay Enterprise owns VendorNet, which offers an omnichannel solution to let retailers fulfill online orders from their stores. In its Q2 earnings slide deck, eBay included in a slide - "Omnichannel technology: ship from store has saved 4M orders from out of stock inventory" - another reason retailers like store fulfillment.